Susanne Christensen works with video, photography and installation. The projects are often performative and related to institution and architecture . Through combining documentation of the setting and its surreal distortion by a performer she often choose to evoke colliding realities and the overlap of visual languages. 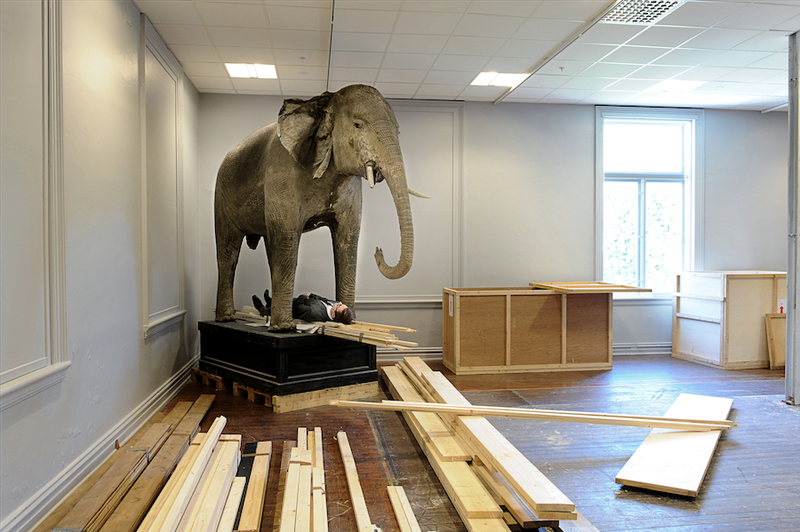 Nature morte is created at the Stavanger museum’s nature historical department. 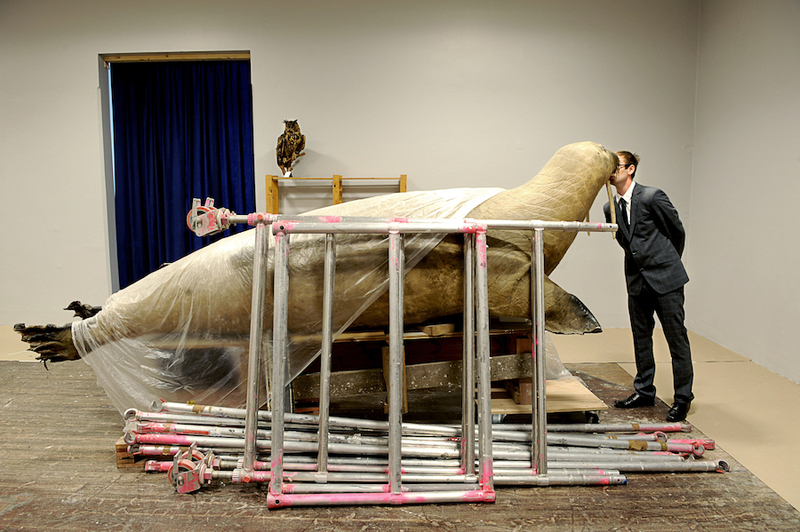 I was aloud to come «backstage» in the large storage spaces, where the collection’s animals are kept. I have directed the photo by having a young model dressed in a suit interact with the tableaux which are naturaly there in the storage room, not changing anything. My aim in the project has been to use the storage logistics order and disorder. 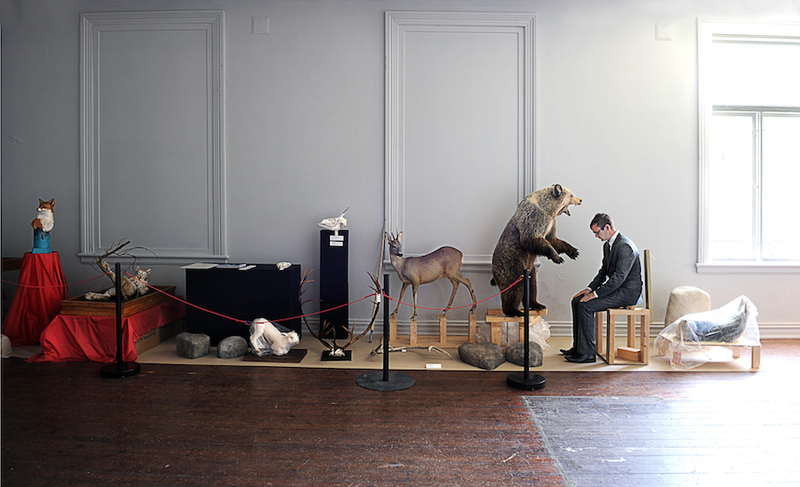 The conflict between the storage room’s chaos and the stuffed animals creates a surealistic esthetic, making, in this way, the room’s unconcious univers of display the esthetical focus. I try here to check out the relationship between culture and nature and it’s scientific tradition which goes back to the last century, when the institution was created. Nature morte har sit udgangspunkt på Stavanger Museum, naturhistorisk afdeling. Jeg har fået anledning til at komme bag “scenen” på deres store lagre, hvor de opbevarer dyr fra samlingen. En ung mand er iscenesat i dress og er i interaction med de tableauer som naturligt er tilstede på lageret. Jeg har i projektet været optaget af at bruge lagerets logistiske orden eller uorden. Sammenstødet i mellem lagerets kaos og de udstoppede dyr, har skabt en egen surreal æstetik. Med andre ord har jeg brugt lagerets såkaldt ubevidste opstillingsunivers som et æstetisk greb. Her prøver jeg at undersøge kulturens forhold til naturen og den videnskabs tradition, som går tilbage til forrige århundrede, og som institutionen er indskrevet i.